Robert Edwards has made a name for himself in his first appearance representing the Saint Augustine's University Men’s Cross Country team. 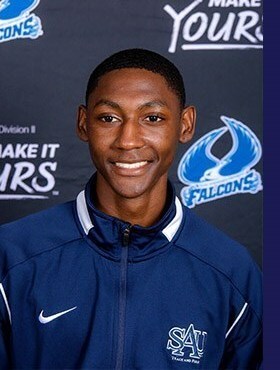 Baron Freeman of Saint Augustine's University won the Men's 8K race and teammate Edwards finished second in the Monarch Cross Country Classic at Methodist University in Fayetteville, N.C.
Freeman crossed the finish line first in 30:27.25 followed by Edwards in 32:05.72, Saint Augustine placed four runners in the top 35. Robert Walker was 24th in 39:09.23 and Gregory Matthews finished 34th in 41:28.65 in the race, which consisted of 64 runners. Saint Augustine scored 98 points to finish fourth out of nine teams.